We all know that a woman is entitled to change her mind. Quite frequently if she’s a Gemini. And, when she comes back from France with bronchitis, morphing into pneumonia, that sidelines her for a couple of months during the Holidays and beyond; even more entitled to change her mind. Now before we get into the real gist of my post, I’m sharing a few pics from France. I wish they could talk; they’d have so much to say. So without further ado, welcome to Barb’s show and tell. Well, let’s start with Nice. The Blue Chair is the symbol of the city. Very fitting, I think. 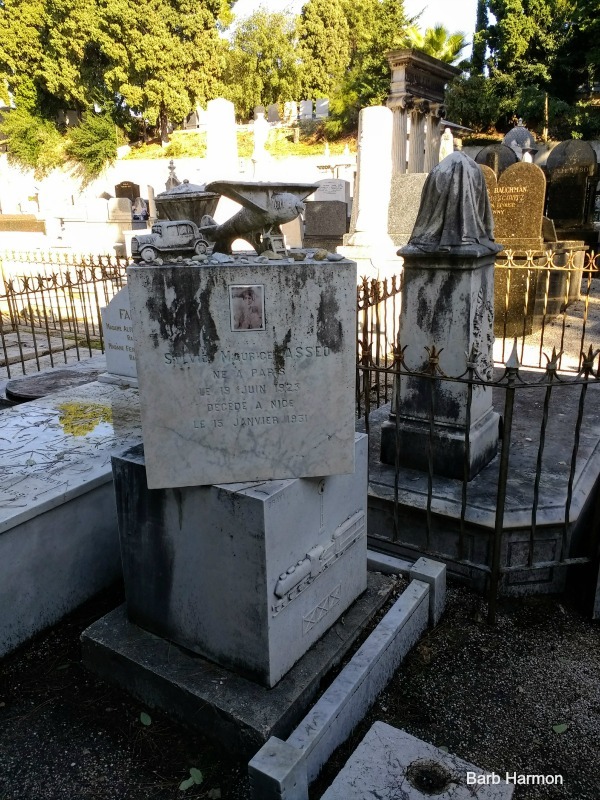 You know I love cemeteries, and Nice has one of the most beautiful cemeteries I’ve been fortunate to visit. It’s called Cimitiere du Château. The cemetery was founded in 1783; it’s divided into three sections; Protestant, Catholic, and Jewish. The location is drop dead (no pun intended); it’s on the top of Castle Hill and overlooks the Mediterranean. I wandered for hours; the funerary artwork was breathtaking. Large, ornate, delicate, and sweet; it covered the gamut. I cried as I walked. Nice was one of J.W’s happy places. 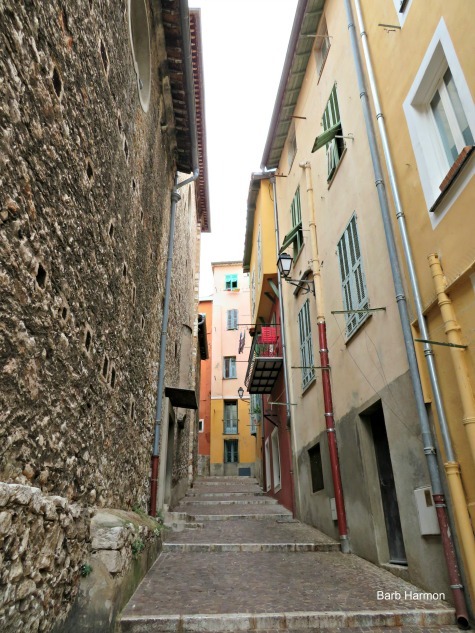 Èze is the most beautiful of the perched villages (my opinion). It’s a crazy drive to the top which accounts for a handful of new white hairs (or highlights as J.W. called them). I haven’t colored my hair for about a decade, so they’re staying. A lovely souvenir of a great time. Click here to read about a fab restaurant. It was a clear, sunny day when I visited. If you have the opportunity to visit, check the weather; you need a clear day to fully appreciate the view. Well, I had great weather during my time in France, as well as the worst weather in decades. 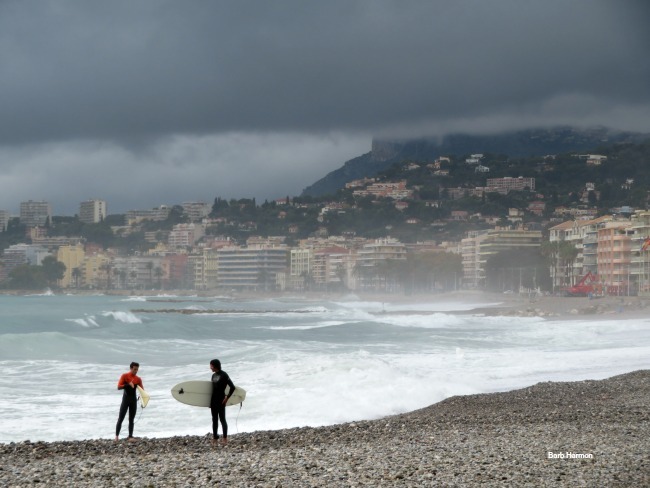 October 29th in Menton was cold, rainy, and blustery. Really blustery, like, blow your house down blustery. Of course, I decided to wave watch. I’ve visited many times, but I’ve never seen anyone surfing. That day, a different story. On the downside, there was extensive flooding in the town. 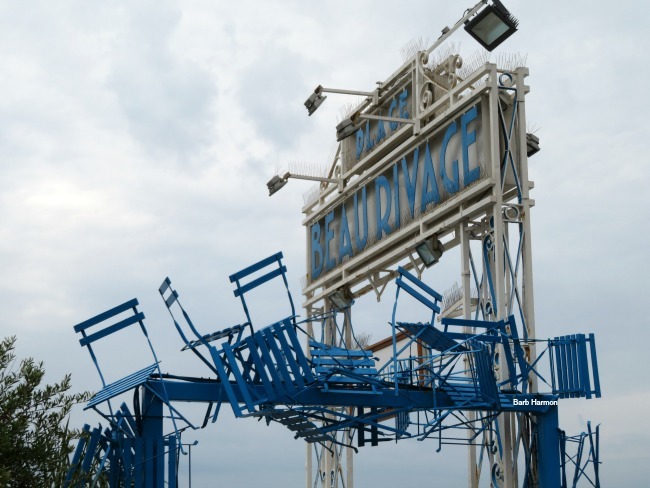 The Jean Cocteau Museum is still closed months later; many of his works were damaged. The name alone sounds expensive. But, bargains are to be had if you know when to go. More on that in another post. Doesn’t this photo scream FRANCE? Click here to read about another fab restaurant. 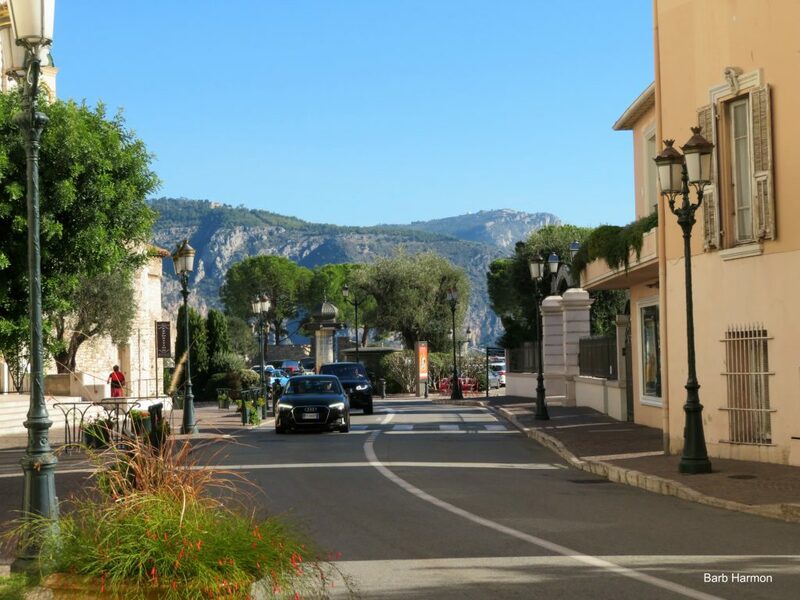 If you’re looking for a chill location, visit Beaulieu-sur-Mer. 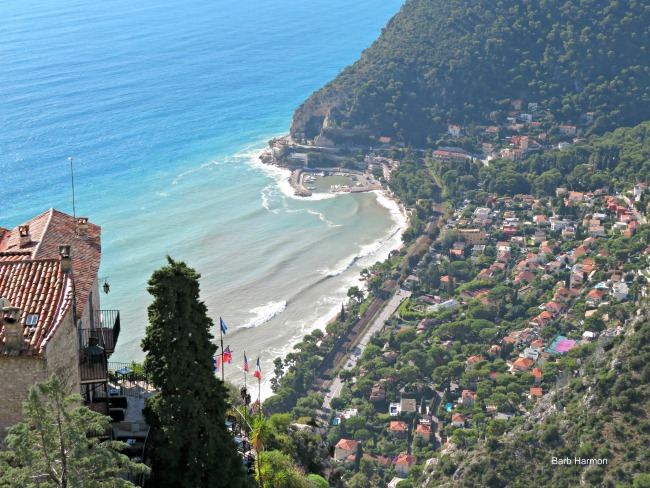 This seaside village lies between Nice and Monaco. 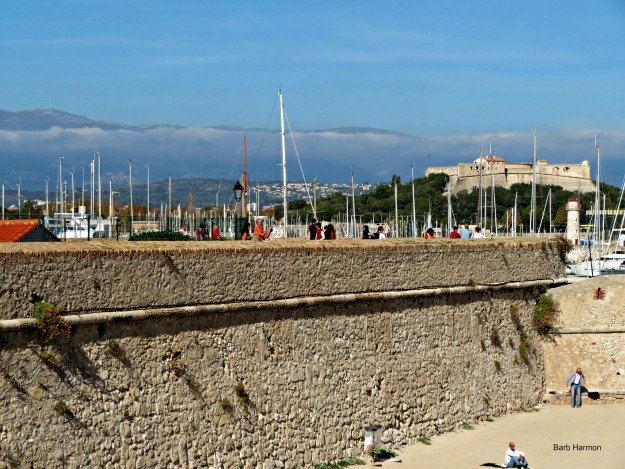 It’s a walker’s paradise; it’s also one of the prettiest towns on the Riviera. You’ll find hilly terrain, gorgeous, honey-colored buildings with shutters and wrought-iron balconies, flowering bushes, and trees. Quintessential French. 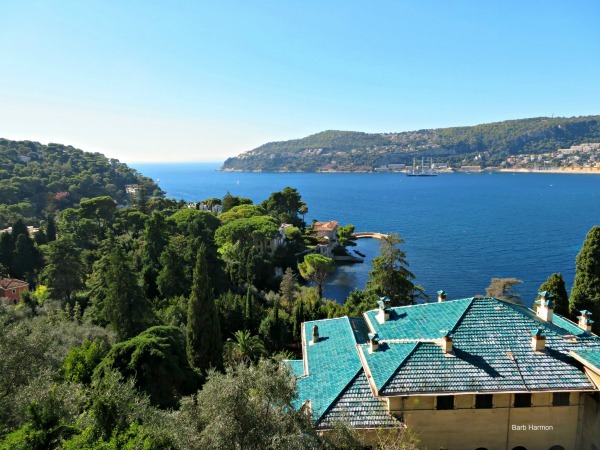 Saint-Jean-Cap-Ferrat could possibly be one of the most glorious places I’ve visited. In my entire life. Period. 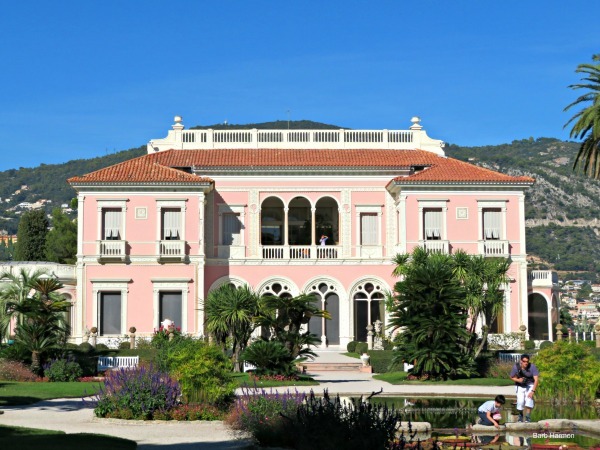 And Villa Ephrussi de Rothschild, with its acres of gardens (nine large, and different gardens) is to die for. If you have the opportunity, this is a MUST VISIT. To read about another FAB restaurant, click here. Many of you know how much I love this place. Great food, enchanting architecture, friendly people, this village has it all! 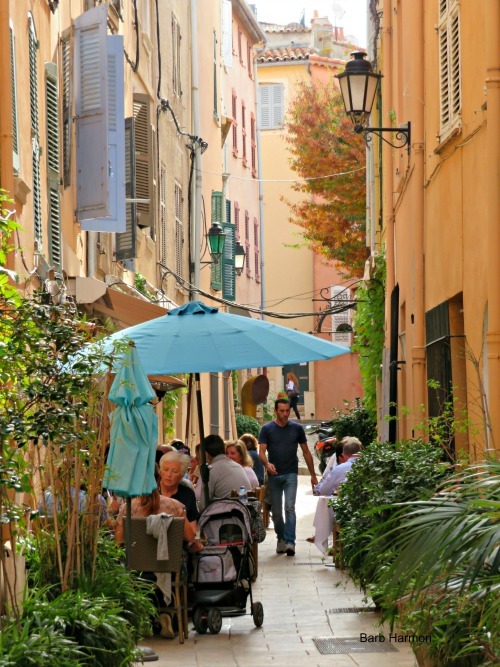 With a wonderful market, scores of restaurants, shops, and boutiques, you’ll stay busy. I fell in love with the openness of the people, the history, and friendly vibe years ago. I’m happy to say, it hasn’t changed, and that’s a good thing. The 16th century Fort Carré is in the background. Another Fab read coming Thursday. 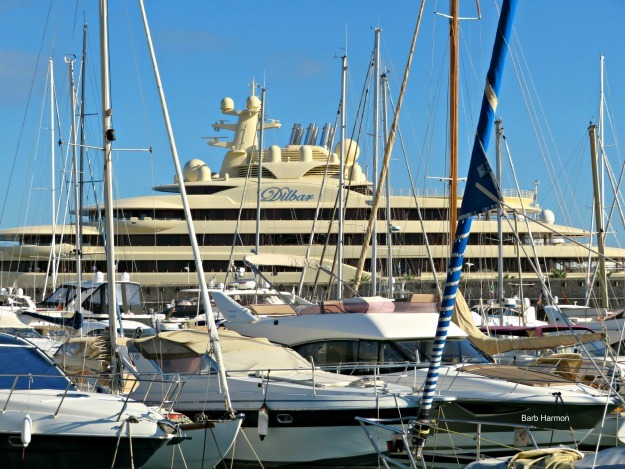 While I didn’t venture into Cannes on this visit, I did sail by on the way to Saint-Tropez. This is a pic of J.W’s favorite hotel. It was the Noga Hilton, now it’s a J.W. Marriott. He’d be tickled. It’s been there for a few months, BUT now things are rolling along quickly. We’ve leased a flat, opened up a French bank account (while in the US), and I have about 100 more white hairs. Well worth it! I’ll leave you with this photo of one of the Juliette balconies. This is off the kitchen: I’ll be sitting there in July with wine in hand. Thank you for visiting. It’s always appreciated. Barb, Wish you both all the love, all the happiness on this new adventure!! Wonderful post and great photos, as always! I’m so glad you took the time to read my rambling post, and comment! Thank you, for your kind words. We’re so excited. Thank you for visiting, and commenting. Can you believe it? This has been a longggggg time coming. Woohoo and much happy dancing around here. Girlfriend, I hope you visit. What a marvelous time we would have. Thank you for reading the ramblings of an enthusiastic Francophile, and commenting. I appreciate it! 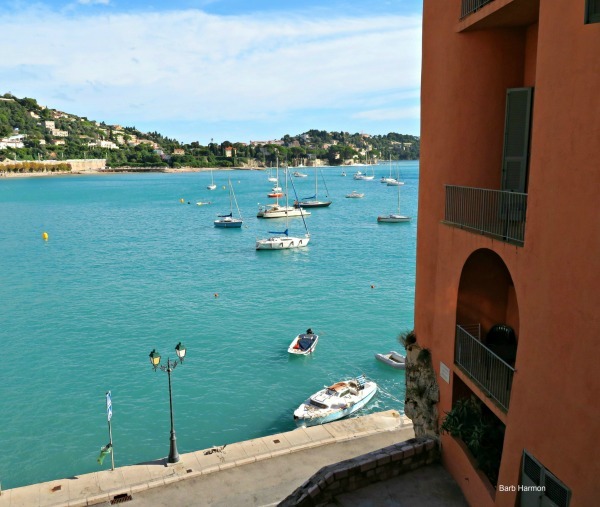 Well, you were in one of the best spots in Villefranche-sur-Mer. It is heavenly. Visit, please. We’ll do an Insta, FB party. Thank you for reading my rambling post, and commenting! I wake up in the night and pinch myself… so excited. Thank you for stopping by, and commenting. It’s much appreciated. 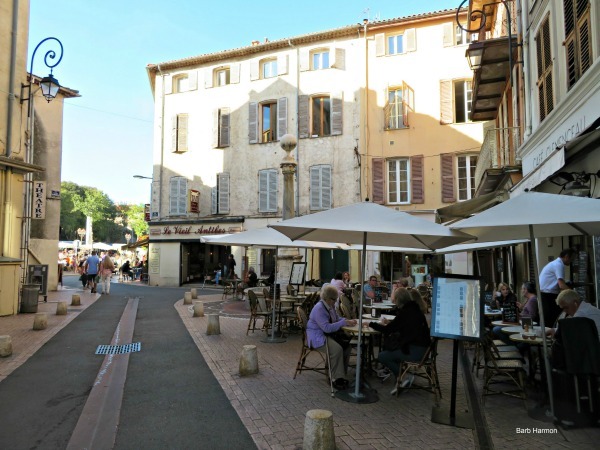 We’ll be in Pezenas; a hop, skip, and a jump from the Med. It would be wonderful to have you as a neighbor. We’d have so much fun! 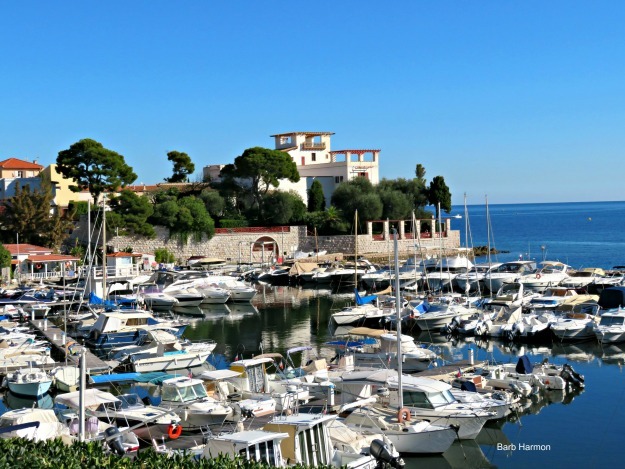 You covered all my favorite spots on the French Riviera. 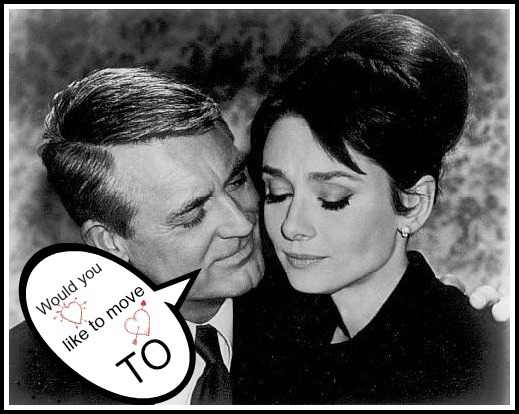 I know it’s exciting to be moving to a place that is so dear to your heart! 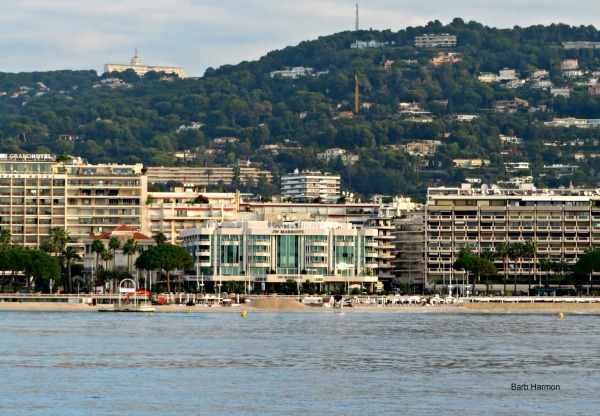 I love France and especially the Cote d’Azur. I have such wonderful memories of all my visits there. Looking forward to your steps forward. Thank you for visiting, and commenting. It’s appreciated! That area has held my heart forever. Isn’t it gorgeous? 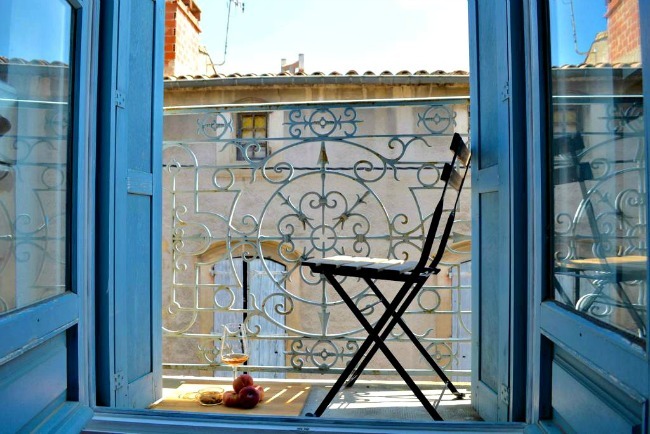 Our flat is in the ‘other South of France’; we’ll be living in Pezenas, about 15 minutes from the Mediterranean and close to the vines. I’m looking forward to experiencing everything! What a dream come true. This is paradise. I’m so very happy for you. This is great news. Hi Laurie! How are you? Can you believe it? We are giddy, well I am giddy anyway. Thank you for your words, they mean a lot. And, Thank you for taking the time to read my rambling. You’ll just have to visit! Remember the team from Renestance we met in Paris last March? We engaged their assistance, and Nicole actually found the apartment. I loved this post, full of adventure, spirit, and love of life! I am thrilled for you and shall continue to wait for further adventures, as you live the dream. Thank you so much! We are beyond excited; its been a long time coming. When we visited the village last March, it grabbed hold of us and never let go. Thank you for visiting, and commenting. You are always welcome for a visit. So glad you got past the nasty bronchitis/pneumonia thing. Just as my Pieter struggled for some three weeks. Yes, we know what it means to prepare for an exit from the US and going to the Embassy etc. We did that in Pennsylvania for our job and move to the Venice/Italy area. It sure takes a while for settling in and getting things in order but then, spring and summer can be enjoyed in your new environment! Thank you for reading along, and leaving a comment. It’s much appreciated! I’m glad Pieter is better, take good care of yourself. Nasty stuff! We plan to leave AZ around July 7th headed to Paris. A couple of days there, then the TGV to Montpellier, and finally arriving in Pezenas. We should be there for Bastille Day. Whew. I’d love for you to visit. You know your way around France, girlfriend. We’d have a good time. Oh dearest Barb, that would be a dream! But by then my Pieter will be 90… and traveling is not the same anymore. Who knows how and when! Wishing you all the best during your preparation period. We have crossed the Atlantic a couple of times for a move; so we know! Thank you, for wishing the best during this time. As you know, it’s unbelievably stressful. This is a full-time job. I found out today that the movers will most likely use an external ladder lift to hoist things up to the flat. It’s on the 2nd floor (3rd floor in the US). In Italy where we moved to from Pennsylvania/USA, they too had to use an external ladder lift to our 5th floor of the apartment! That was very scary but they did it, all through the double windows… WOW! But all things will work out, even if scary at the time. Focus on Bastille Day… skip the rest, just go through it more robotic, not with full mind. You are so right, all things will work out. I need to focus on those words, oh wise woman. Thanks Barb, I traveled with you remembering our time on the Riviera. What a wonderful new chapter for you guys being able to move to Europe. Thank you for stopping by and commenting; you know it is appreciated. Did you enjoy your trip? The south is a stunning area. We’ve talked about moving for so long; now that the plan is rolling along it seems like a dream. Exciting, scary, overwhelming at times. Please visit our area. We’d have a blast. Steve and I are planning a Viking River Cruise for 2020. It’s a 21day tour of the Seine then a train ride to Lyon to travel the Rhone…with a 3 night stay in Paris and, at the end, another 3 day stay in Nice. This will be in October. So, if you are settled in by the end of next year and available, maybe we can meet up somewhere…who knows! Terry, your trip sounds fantastic! We should be settled in by that time (dear Lord!). It would be wonderful to finally meet in person.